Bring your canvas(es) and have the whimsical Mary Legallet of Whimsical Stitch help you bring it to life in these group classes. Mary writes a blog, creates stitch guides and teaches nationally. Sherry teaches City Homes from MaggieCo. 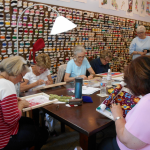 Join us for a day in San Francisco learning Stump Work at The San Francisco School of Needlework and Design.